My apologies for the late review of this one! I actually used this last winter, but I finally got around to writing about it now. Oopies. 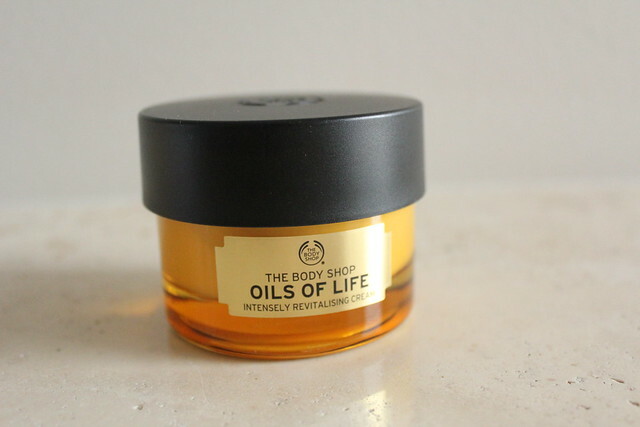 One of the most exciting releases of last year was The Body Shop’s Oils of Life collection, the skincare branch of The Body Shop’s new foray into high end skincare and bodycare. I previously reviewed the Spa of the World collection here. Similarly to my reaction to the Spa of the World products, I was very happy with the Oils of Life products. What it claims (from thebodyshop.ca): By infusing 3 precious seed oils from around the world, known for their revitalising and repairing properties on skin – Black Cumin seed oil from Egypt, Camellia seed oil from China and Rosehip seed oil from Chile – in to a silky cream with perfecting micro-pearls, we created a daily cream that intensely revitalises skin, replenishes moisture and revives radiance. Signs of ageing appear visibly reduced. From the moment it touches the skin, this Intensely Revitalising Cream effortlessly melts onto the face, leaving a light and comfortable finish without a greasy feel. The good: My first impression is that I love the heavy glass jar that it comes in – it looks and feels so much more luxurious than it really is. Despite being a deeply nourishing cream, the Oils of Life Intensely Revitalizing Cream has a relatively light, whipped texture that absorbs quickly and completely into my skin without feeling sticky or heavy. 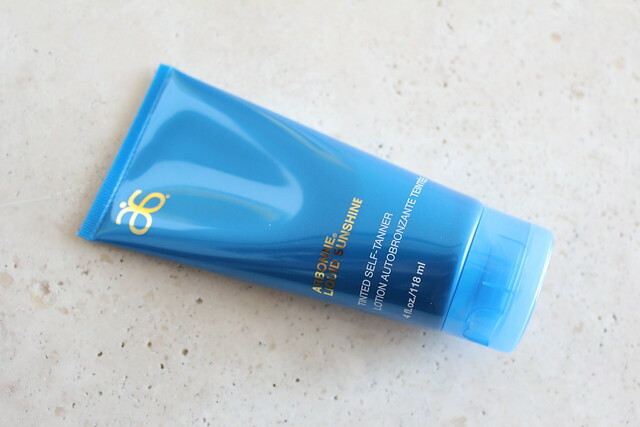 I use this at night because it’s a bit heavier than what I need during the day, and each morning I wake up to very hydrated, smooth, and radiant skin. The bad: My skin isn’t super sensitive but I find that for the first 5 seconds after applying the cream, it stings a little bit. This feeling quickly goes away, and my skin doesn’t look or feel irritated after. I’m not sure what ingredient is causing this, but since I didn’t see any long term arm, I continued to use this. The spicy scent is a bit too strong, and doesn’t dissipate immediately which can also irritate those with sensitive noses, but after I while I got used to this. If I had a choice, though, I’d prefer it to be scent-free. 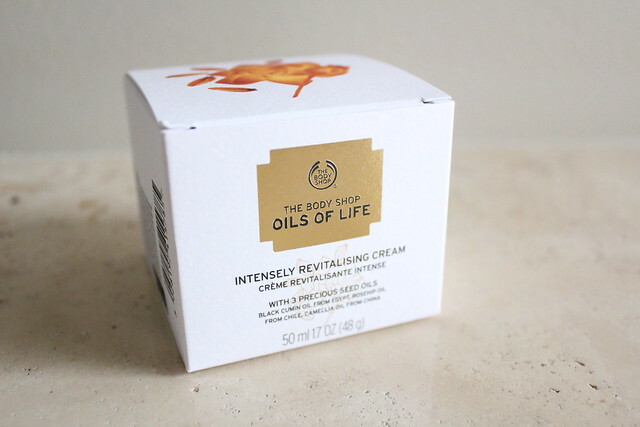 Overall: This C$34 cream is a winner from The Body Shop. It makes my skin feel super nourished and deeply hydrated, without the heavy greasy feeling. After a few weeks of using this, I can say this is comparable to my Tatcha Ageless Enriching Renewal Cream (which is more than six times the cost in C$) because it makes my skin feel so good. The Tatcha version is gentler for those with sensitive skins though, because The Body Shop cream caused some mild sensitivity. There is also a Gel Cream version of this cream, which is much more lightweight and more suitable for those with combination skin, or daytime use. Personally, I’d still stick to the Cream version because I prefer that thicker, creamier texture. 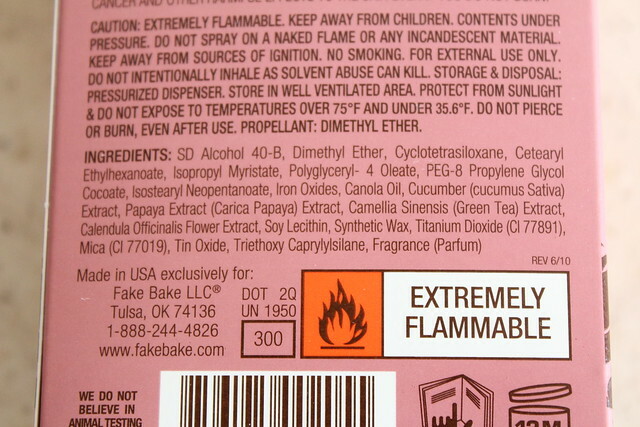 Ingredients: Aqua/Water/Eau (Solvent), Hydrogenated Polyisobutene (Emollient), Dimethicone (Skin Conditioning Agent), Glycerin (Humectant), Aluminum Starch Octenylsuccinate (Absorbent/Anticaking Agent), Cetyl Alcohol (Emulsifying Agent), PEG-40 Stearate (Emulsifying Agent), Glyceryl Stearate (Emulsifying Agent), Octyldodecanol (Emollient), Olea Europaea Fruit Oil/Olea Europaea (Olive) Fruit Oil (Emollient), Butyrospermum Parkii Butter/Butyrospermum Parkii (Shea) Butter (Skin Conditioning Agent – Emollient), Fagus Sylvatica Bud Extract (Skin Conditioning Agent), Phenoxyethanol (Preservative), Polyacrylamide (Film Former), Sorbitan Tristearate (Emulsifying Agent), Rosa Canina Fruit Oil (Skin Conditioning Agent), Camellia Oleifera Seed Oil (Skin Conditioning Agent – Emollient), Caprylyl Glycol (Skin Conditioning Agent), C13-14 Isoparaffin (Solvent), Glycine Soja Protein/Glycine Soja (Soybean) Protein (Skin Conditioning Agent), Mica (Opacifying Agent), Parfum/Fragrance (Fragrance Ingredient), Tocopherol (Antioxidant), Adenosine (Skin Conditioning Agent), Nigella Sativa Seed Oil (Emollient), Laureth-7 (Emulsifying Agent), Linalool (Fragrance Ingredient), Myristyl Alcohol (Emulsifying Agent), Stearyl Alcohol (Emollient), Disodium EDTA (Chelating Agent), Citric Acid (pH Adjuster), Limonene (Fragrance Ingredient), Sodium Cocoyl Glutamate (Surfactant), Geraniol (Fragrance Ingredient), Citronellol (Fragrance Ingredient), Ethylhexylglycerin (Skin Conditioning Agent), Sodium Benzoate (Preservative), Potassium Sorbate (Preservative), Benzoic Acid (Preservative), Tin Oxide (Opacifying Agent), Sorbic Acid (Preservative), CI 77891/Titanium Dioxide (Colorant), CI 19140/Yellow 5 (Colorant), CI 14700/Red 4 (Colorant). The Body Shop’s newest release for fall is their Spa of the World collection, featuring products formulated with key ingredients from around the world. I was sent two of the luxurious body creams to try out, and I have to say I am thoroughly impressed. My general thoughts are that I definitely prefer these body creams to The Body Shop’s popular body butters. I find the body butters can be too greasy (“buttery”) and don’t always absorb well. In addition, the Spa of the World products are scented more naturally compared to the body butters that can smell extremely synthetic (I’m looking at you, mango). Despite the $35 price tag, the jars are MASSIVE at 350mL. If you compare side by side with the body butters which are $20 for 200mL, you get 1.5x more product in the Spa of the World body creams, at 1.5x the price, which is completely reasonable. 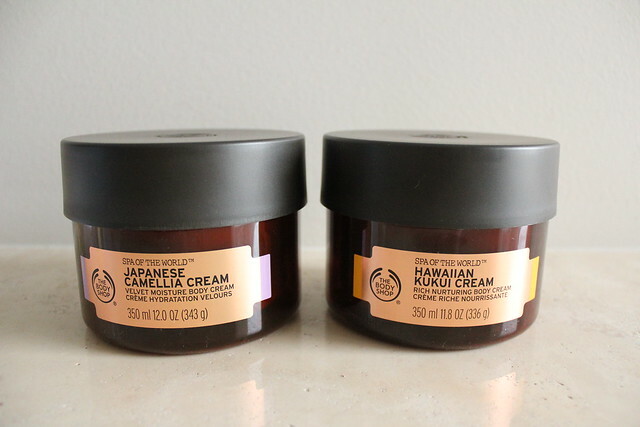 I recommend both of these body creams – they’re full of great ingredients for hydrating and protecting your skin, they’re priced right, and they smell amazing. Overall, I’m really happy with the new direction that The Body Shop is going with these Spa of the World products. I can’t wait to see more of what they have in store going forward! The Body Shop Spa of the World Hawaiian Kukui Cream (C$35) features Hawaiian kukui oil (listed as Aleurites Moluccana Seed Oil on the ingredients list). The top three ingredients after water are brazil nut oil (Bertholletia Excelsa Seed Oil), cocoa seed butter, and shea butter. This body cream is ultra luxurious, very thick, and highly moisturizing. 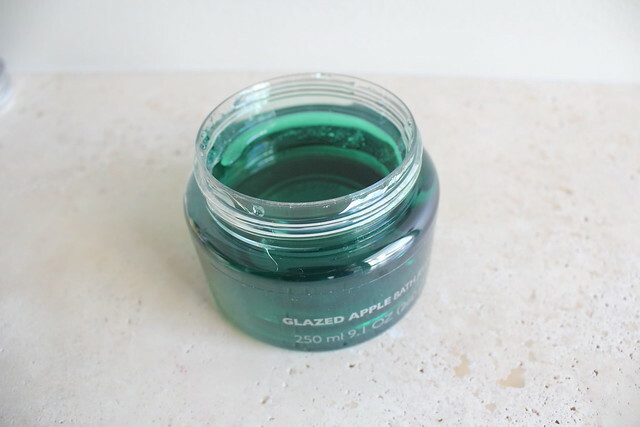 I use this on very cold, dry nights when my skin is dry and scaly – a little bit goes a long way, so this jar would likely last me the entire winter. It smells absolutely amazing, like a warm, nutty scent that reminds me of cosy blankets and my bed, and would complement well with a big mug of hot chocolate. Ingredients: Aqua/Water/Eau (Solvent), Bertholletia Excelsa Seed Oil (Emollient), Theobroma Cacao Seed Butter/Theobroma Cacao (Cocoa) Seed Butter (Emollient), Butyrospermum Parkii Butter/Butyrospermum Parkii (Shea) Butter (Skin Conditioning Agent), Cetearyl Alcohol (Emulsifying Agent), Glyceryl Stearate (Emulsifying Agent), PEG-100 Stearate (Surfactant), Glycerin (Humectant), Cera Alba/Beeswax/Cire d’abeille (Viscosity Controlling Agent), Ethylhexyl Palmitate (Skin Conditioning Agent), C12-15 Alkyl Benzoate (Emollient), Parfum/Fragrance (Fragrance Ingredient), Caprylyl Glycol (Emollient), Dimethicone (Emollient), Phenoxyethanol (Preservative), Aleurites Moluccana Seed Oil (Emollient), Benzyl Salicylate (Fragrance Ingredient), Xanthan Gum (Viscosity Controlling Agent), Tocopherol (Antioxidant), Disodium EDTA (Chelating Agent), Sodium Hydroxide (pH Adjuster), Benzyl Benzoate (Fragrance Ingredient), Linalool (Fragrance Ingredient), Potassium Hydroxide (pH Adjuster), Ascorbyl Palmitate (Antioxidant), Citric Acid (pH Adjuster), CI 75120/Annatto (Colorant). The Body Shop Spa of the World Japanese Camellia Cream (C$35) contains camellia oil (listed as Camellia Oleifera Seed Oil). The top two ingredients after water are illipe butter (Shorea Stenoptera Seed Butter) and shea butter. The Japanese Camellia Cream is significantly lighter than the Hawaiian Kukui Cream, but continues to be moisturizing. It absorbs a lot easier than the Hawaiian Kukui Cream as well, making this ideal for application after morning showers. It has a very light, fresh scent that’s refreshing but soothing. Between this and the Hawaiian Kukui Cream, I think i prefer the Japanese Camellia Cream better because it’s more lightweight and also smells fresher. I’ll definitely repurchase this! Ingredients: Aqua/Water/Eau (Solvent), Shorea Stenoptera Seed Butter (Emollient), Butyrospermum Parkii Butter/Butyrospermum Parkii (Shea) Butter (Skin Conditioning Agent), Olus Oil/Vegetable Oil/Huile végétale (Emollient), Sodium Polyacrylate (Viscosity Increasing Agent), Parfum/Fragrance (Fragrance Ingredient), Pentylene Glycol (Solvent), Camellia Oleifera Seed Oil (Skin Conditioning Agent), Phenoxyethanol (Preservative), Caprylyl Glycol (Skin Conditioning Agent), Mangifera Indica Seed Oil/Mangifera Indica (Mango) Seed Oil (Emollient), Hydrogenated Vegetable Oil (Emollient), p-Anisic Acid (pH Adjuster), Benzyl Salicylate (Fragrance Ingredient), Candelilla Cera (Emollient), Sodium Hydroxide (pH Adjuster), Disodium EDTA (Chelating Agent), Linalool (Fragrance Ingredient), Limonene (Fragrance Ingredient), Citronellol (Fragrance Ingredient), Tocopherol (Antioxidant), Citric Acid (pH Adjuster). Okay so this is like, super late. I’m sorry *hangs head in shame* but hey if you’re in a happy relationship, then every day should be Valentine’s Day! So I am featuring some Valentine’s Day products that can be used year-round, but sadly only available now. If you like these, better go out and stock now up! I always look forward to LUSH’s Valentine’s Day products because I’m completely addicted to that sweet, fruity scent that LUSH usually puts out during this time of year. 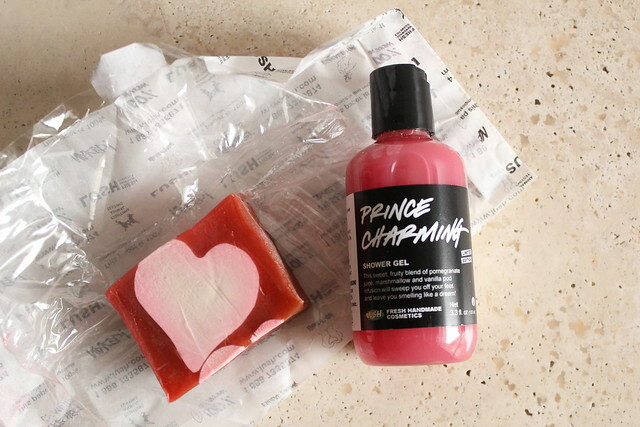 This year, I got to try Cupid’s Love Soap (AKA Neon Love from prior years) and Prince Charming Shower Gel. Yup, I am still addicted to that sweet, fruity scent. Cupid’s Love is a blend of passion fruit, fresh figs, bergamot, cinnamon, and rosewood to create zesty yet intense fragrance, perfect for frolicking in the bath with your significant other. It also contains glycerin, rapeseed oil, coconut oil, and soy yogurt as four of the first five ingredients, which means you’ll leave the shower (or bath, you know, after the frolicking) with beautifully soft and smooth skin. Prince Charming Shower Gel is a blend of pomegranate, grapefruit, sandalwood, and geranium that creates a bubbly lather and a bubble of fragrance that will help to perk you up in the morning. Also, did I mention it’s a bright perky shade of pink? Yes, the Valentine’s Day products shown here are very typical girly and bright. 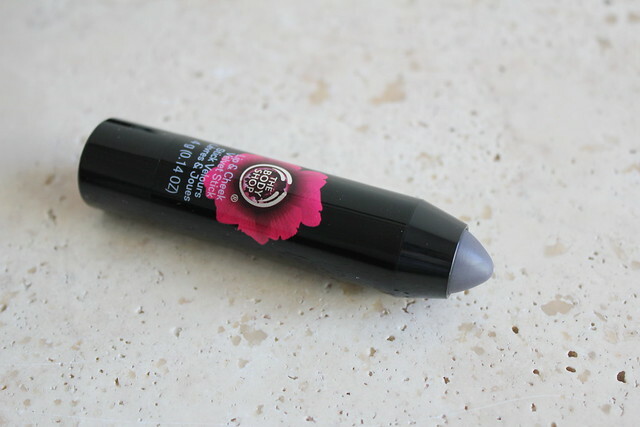 On the flip side we have the sultry, which is the Body Shop Smoky Poppy collection. Not gonna lie, this is one of my favourite The Body Shop scents released to date – the smoky poppy is a dark fragrant floral. I have a really hard time describing what exactly it smells like, but it’s kind of a floral but blended with darker musks or even incense. You got to try this out in stores because it is very addicting to sniff. The scent is also pretty unisex, so you can finally buy a fragranced shower gel that your man will enjoy using but won’t be embarassed about it even though it’s technically still floral. The Smoky Poppy Shower Gel… is black. It is literally tinted black, something I’ve never seen before, but is super cool. As with all The Body Shop Shower Gels, it lathers up nicely, cleans well, and leaves a subtle lingering scent. It’s a classic formula, and you can’t go wrong by getting it in this scent. 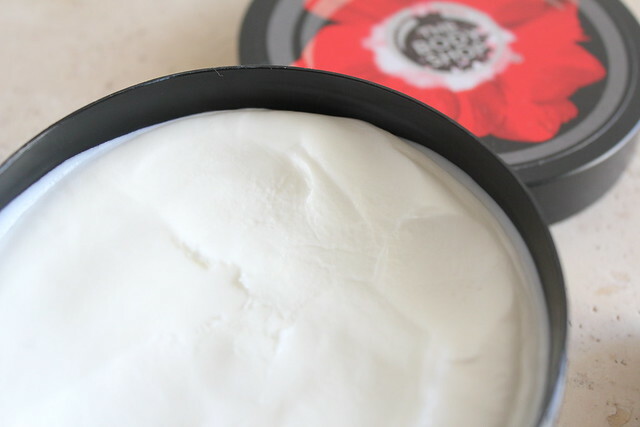 The Smoky Poppy Body Butter is one of the best body butter formulas I’ve used from the Body Shop, and in general in my body butter usage history. It’s rich yet not greasy or heavy, absorbs quickly, ultra moisturizing, and leaves just a subtle lingering scent that dissipates after 1-2 hours. Lastly, the coolest item of them all, the Lip & Cheek Velvet Universal Shade is a black-tinted lip and cheek stain that will give you a custom colour based on the unique pH balance of your skin. In reality, that’s kinda true but you usually end up with a dark, plummy stain which is great for the fall season. Both of these collections are available for a limited time only, so if anything peaks your interest, you should go out and take a look naaaao! The Body Shop always does a very extensive collection of gifts for the holiday. There’s a nice selection of inexpensive stocking stuffers and full size gifts for all budgets, and all conveniently gift wrapped so that you don’t have to! 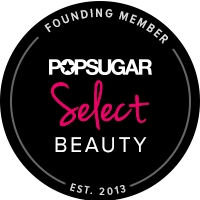 I highly recommend checking out the Wild Argan Oil collection (reviewed here), which is easily one of my favourite Body Shop lines. Even for yourself, these Body Shop gifts make great travel sets. I recently brought the mango one with me to Mexico and it was the perfect size for a week-long trip. The mango scent is also so appropriate in that tropical weather. For this holiday, the Body Shop also released three new and limited edition scents – Frosted Cranberry, Glazed Apple, and Vanilla Brulee. These three scents are so different but all encompass the spirit of Christmas! Frosted Cranberry is like fresh cranberries and Glazed Apple is like candied apple. Vanilla Brulee, my favourite of the bunch, is like creme brulee, and it smells extremely decadent. These scents are available in the usual Body Shop products, as well as a limited edition Bath Jelly that’s a super cool textured bubble bath mix. The Body Shop holiday sets are available now at the Body Shop stores and online. For fall 2014, The Body Shop released a line of new body care products using community fair trade wild argan oil from Morocco. The Body Shop Wild Argan Oil collection contains 9 products for both the body and hair; I’ll be sharing with you my thoughts on the Massage Soap, Shower Gel, and Body Lotion. A common denominator in the Wild Argan Oil collection is of course the wild argan oil ingredient, as well as the warm, cocoa-like scent that’s dominant in all of the products. I have to say I am a big fan of both the moisturizing wild argan oil as well as the scent that helps me relax after a long day of work. The Body Shop Wild Argan Oil Massage Soap ($6) is a creamy soap bar with protruding bits that are used for massaging the skin. I love using this at night while taking a long, hot shower because while it foams it, the foam is very creamy and leaves my skin feeling silky smooth after. I normally avoid bar soaps but this one is super moisturizing. The massaging bits is also nice to use, mostly around my thigh, tummy, and back area. The only thing is that because I’m so focused on only using the uneven side to wash my body, the massaging bits got used up pretty quickly. Buy? Yes, but keep in mind the massaging bits gets used up quite quickly so you’ll just be left with a moisturizing bar soap after. Ingredients: Sodium Palmate (Surfactant), Aqua/Water (Solvent/Diluent), Sodium Palm Kernelate (Surfactant), Glycerin (Humectant), Sorbitol (Humectant), Coconut Acid (Surfactant), Argania Spinosa Kernel Oil (Skin-Conditioning Agent), Parfum/Fragrance (Fragrance), Triethanolamine (pH Adjuster), Butyrospermum Parkii Butter/Butyrospermum Parkii (Shea) Butter (Skin Conditioning Agent – Emollient), Etidronic Acid (Chelating Agent), Tetrasodium EDTA (Chelating Agent), Coumarin (Fragrance Ingredient), Citric Acid (pH Adjuster), CI 77492/Iron Oxides (Colorant), CI 77891/Titanium Dioxide (Colorant), CI 77491/Iron Oxides (Colorant), CI 77499/Iron Oxides (Colour). The Body Shop Wild Argan Oil Shower Gel ($9) has a thick, almost honey-like consistency. It foams up relatively well with a loofah, but the foam dissipates quickly. It cleanses pretty well and leaves my skin feeling moisturized and smooth. Again, I love the argan oil scent and I feel like I’m in a cloud of this scent when I use the Shower Gel. The only downside is that because of the thicker consistency and how the foam dissipates so quickly, I find myself using more of this each time, and thus using it up really quickly. Buy? Yes, if you want a moisturizing shower gel and don’t mind that it will get used up quickly. Ingredients: Aqua/Water/Eau (Solvent/Diluent), Sodium Laureth Sulfate (Surfactant), Cocamidopropyl Betaine (Surfactant), PEG-40 Hydrogenated Castor Oil (Emulsifier), Glycerin (Humectant), Sodium Chloride (Viscosity Modifier), Parfum/Fragrance (Fragrance), PEG-120 Methyl Glucose Dioleate (Viscosity Modifier), Argania Spinosa Kernel Oil (Skin-Conditioning Agent), Polyglyceryl-2 Caprate (Skin-Conditioning Agent), Mel/Honey/Miel (Natural Additive), Sodium Benzoate (Preservative), Citric Acid (pH Adjuster), Disodium EDTA (Chelating Agent), Coumarin (Fragrance Ingredient), Polysorbate 20 (Emulsifier), Denatonium Benzoate (Denaturant), CI 15985/Yellow 6 (Colorant), CI 19140/Yellow 5 (Colorant), CI 17200/Red 33 (Colorant), CI 42090/Blue 1 (Colorant). My favourite of the bunch, the Body Shop Wild Argan Oil Body Lotion ($12) is an ultra moisturizing body lotion. It is a lot thicker in consistency compared to many of the body lotions I’ve tried, almost like a thinner, more refined version of the Body Shop Body Butters. It feels incredible when applied on the skin, sinking in quickly and leaving my skin feeling very hydrated. With high quality and highly moisturizing ingredients such as sweet almond oil, shea butter, and of course the wild argan oil, this product is great for anyone who needs a boost of moisture to their body. It also spreads really easily, and one pump is enough for each leg, and one pump for both arms. I’ve been using this for several weeks and I’ve only made a small dent in it, meanwhile my skin feels amazingly soft. This quality, at the $12 price tag, is definitely worth a try. Ingredients: Aqua/Water/Eau (Solvent), Glycerin (Humectant), Prunus Amygdalus Dulcis Oil/Prunus Amygdalus Dulcis (Sweet Almond) Oil (Skin Conditioning Agent – Occlusive), Orbignya Oleifera Seed Oil (Emollient), Stearic Acid (Emulsifier), Butyrospermum Parkii Butter/Butyrospermum Parkii (Shea) Butter (Skin Conditioning Agent – Emollient), Palmitic Acid (Surfactant), Coco-Caprylate/Caprate (Emollient), Argania Spinosa Kernel Oil (Skin-Conditioning Agent), Sesamum Indicum Seed Oil/Sesamum Indicum (Sesame) Seed Oil (Skin-Conditioning Agent), Talc (Absorbent/Bulking Agent), Tapioca Starch Polymethylsilsesquioxane (Absorbent/Anticaking Agent), Parfum/Fragrance (Fragrance), Phenoxyethanol (Preservative), Caprylyl Glycol (Skin Conditioning Agent), Pentaerythrityl Distearate (Skin Conditioning Agent – Emollient), Glyceryl Stearate (Emulsifier), Acrylates/Vinyl Isodecanoate Crosspolymer (Emulsion Stabilizer), PEG-100 Stearate (Surfactant), Sodium Polyacrylate (Film Former/Viscosity Increasing Agent), Sodium Hydroxide (pH Adjuster), Butyl Methoxydibenzoylmethane (Ultraviolet Light Absorber), Disodium EDTA (Chelating Agent), Coumarin (Fragrance Ingredient), Citric Acid (pH Adjuster), Caramel (Colorant), CI 15985/Yellow 6 (Colorant), CI 19140/Yellow 5 (Colorant). Have you tried any of the new Wild Argan Oil products? 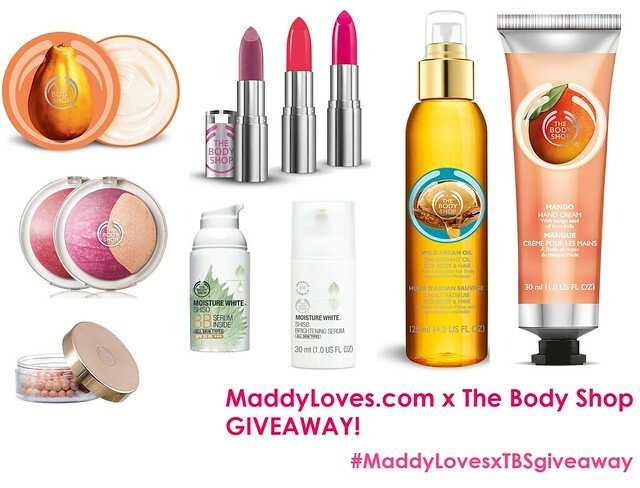 I’m collaborating with The Body Shop to celebrate the opening of a new The Body Shop boutique at Aberdeen Centre in Richmond, BC, and give away over $140 worth of my favourite The Body Shop products! 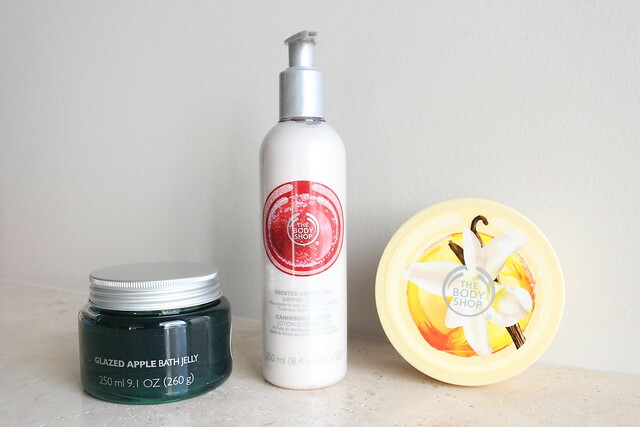 This set was curated by me and includes some of my all-time favourite The Body Shop products. The Papaya Body Butter was my first ever The Body Shop purchase from many, many years ago and still remains one of my favourites to this day. 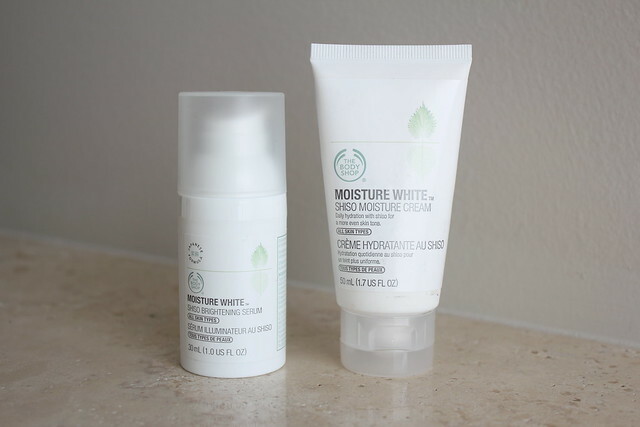 I’ve also previously reviewed the Moisture White Shiso Cleansing Oil and the BB Serum Inside. THIS GIVEAWAY IS NOW CLOSED, THANK YOU FOR YOUR INTEREST! 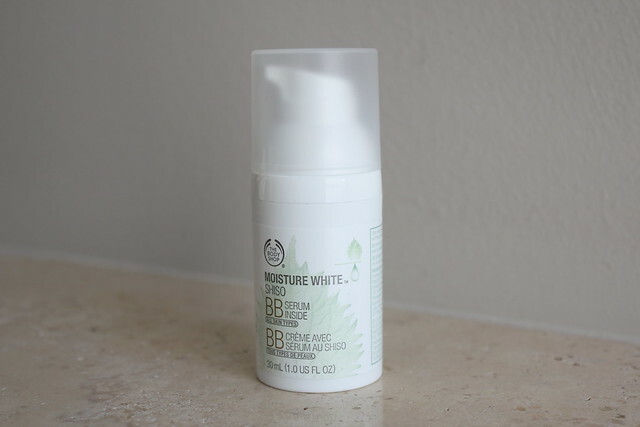 Today is part 3 and the final part of my review on The Body Shop Moisture White collection, which is on the BB Serum Inside BB cream. I’ve also included my final thoughts and some product recommendations from this collection at the end of this post. Please also check out part 1 (Cleansing Oil and Foaming Facial Wash) and part 2 (Serum and Moisturizer) of my reviews. This is one another one of my favourites from The Body Shop Moisture White range (the other being the cleansing oil). 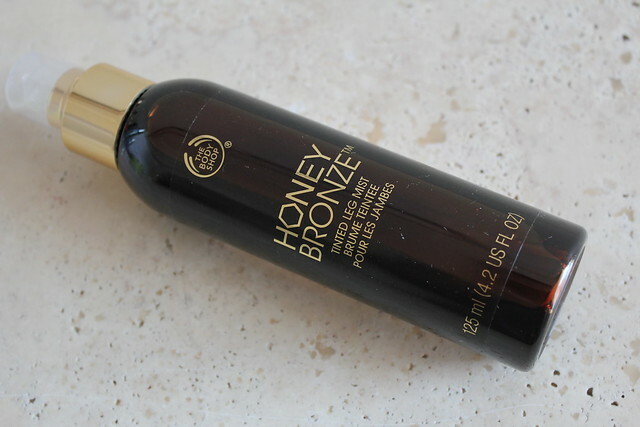 This has got to be one of the best western BB creams I’ve tried – it applies super smoothly, blends in flawlessly, has great pore coverage, evens out skintones, AND does not oxidize, and controls oil relatively well throughout the day. I’ve been using this almost every day since I received it, and it feels completely weightless on my skin. It only comes in one shade, but it’s a pretty good match for my MAC NC25 skin. 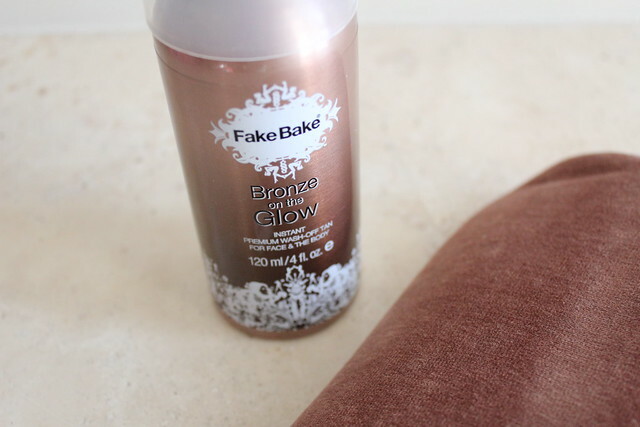 The coverage is medium, although it can be sheered out, it cannot be built to full coverage because then it will get a bit heavy and cakey. I also haven’t found that it disappears off my face during the day so that’s another bonus. 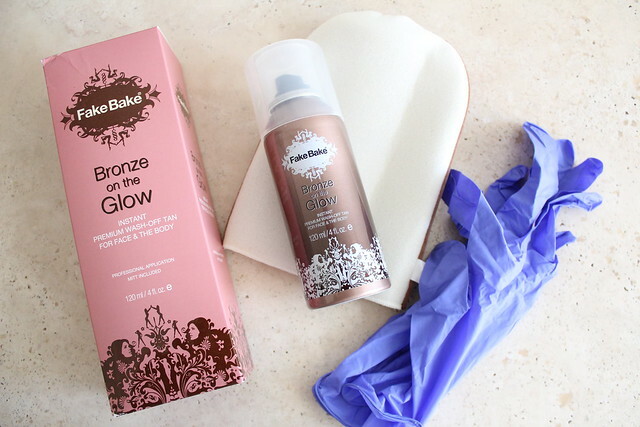 The only thing is I haven’t noticed any brightening effects with this product, although being a makeup product, my expectations were quite low in terms of the skincare benefits. Ingredients: Aqua/Water/Eau (Solvent/Diluent), C12-15 Alkyl Benzoate (Emollient), Dimethicone (Skin Conditioning Agent), Butylene Glycol (Humectant), Ethylhexyl Methoxycinnamate (Ultraviolet Light Absorber), Hydrogenated Polydecene (Skin Conditioning Agent), Glycerin (Humectant), Hydrogenated Poly(C6-14 Olefin) (Skin-Conditioning Agent – Occlusive), Hydrogenated Polyisobutene (Emollient), Magnesium Ascorbyl Phosphate (Antioxidant), Titanium Dioxide[NANO] (Sunscreen), Disteardimonium Hectorite (Suspending Agent), Cetyl PEG/PPG-10/1 Dimethicone (Emulsifier), Polybutene (Binder), Silica (Absorbent), C30-45 Alkyl Methicone (Skin-Conditioning Agent), Isopropyl Myristate (Emollient), Sodium Citrate (pH Adjuster), Aluminum Hydroxide (Opacifier), Stearic Acid (Emulsifier), Phenoxyethanol (Preservative), Chlorphenesin (Cosmetic Biocide), Perilla Ocymoides Seed Oil (Skin-Conditioning Agent), Dimethicone/Methicone Copolymer (Anticaking Agent), Glycyrrhiza Glabra Root Extract/Glycyrrhiza Glabra (Licorice) Root Extract (Conditioning Agent, Humectant), Aloe Barbadensis Leaf Juice (Skin Conditioning Agent), Propylene Glycol (Humectant), Methicone (Skin Conditioning Agent), Pentaerythrityl Tetra-Di-t-Butyl Hydroxyhydrocinnamate (Antioxidant), CI 77891/Titanium Dioxide (Colorant), CI 77492/Iron Oxides (Colour), CI 77499/Iron Oxides (Colour), CI 77491/Iron Oxides (Colour). 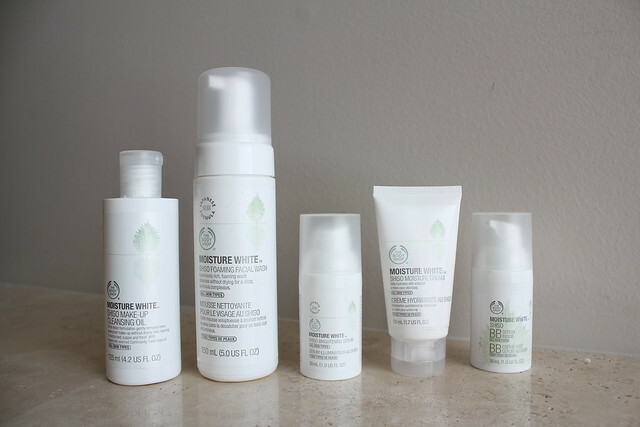 Today is part two of my reviews of The Body Shop Moisture White collection. I’ll be reviewing the Shiso Brightening Serum and Shiso Moisture Cream, two products that are usually at the core of any whitening skincare series. A brightening serum is usually the key product in any brightening skincare regime; a good brightening serum will make or break a brightening collection and unfortunately, the Body Shop Moisture White Shiso Brightening Serum was quite disappointing. I used this product once a day for a few weeks and I did not notice any brightening/illuminating/whitening/effect against hyperpigmentation or dark spots. I had pretty high hopes for this products so I was disappointed to find out that it wasn’t effective at all. In terms of the other benefits of using a serum, this product is not too hydrating and would be an effective hydrating serum for people who normal, combination or oily skin. I used this during the day and it absorbed quickly, leaving behind no residue, which was perfect to follow with makeup application. One thing I want to point out is that shiso (in the ingredients as Perilla Ocymoides Leaf Extract) is actually located at the very end of the ingredients list. Even though I don’t know how effective shiso is as a brightening ingredient, the fact that it is located at the bottom of the list is another disappointment and probably doesn’t help prove that it is an effective ingredient to combat dark spots. Priced at $36 for 30mL, you can purchase the Shiso Brightening Serum from The Body Shop. 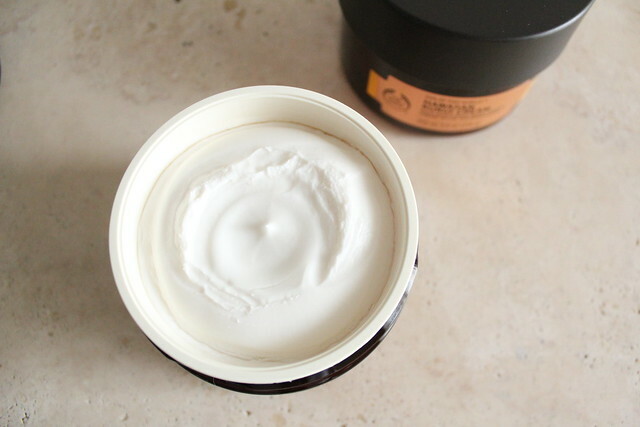 The Shiso Moisture Cream is a relatively basic moisturizer in a thick cream format. It comes out of a squeeze tube and you need about a pea size amount to cover your face and neck. Despite it being a thick cream, it’s actually not that moisturizing. 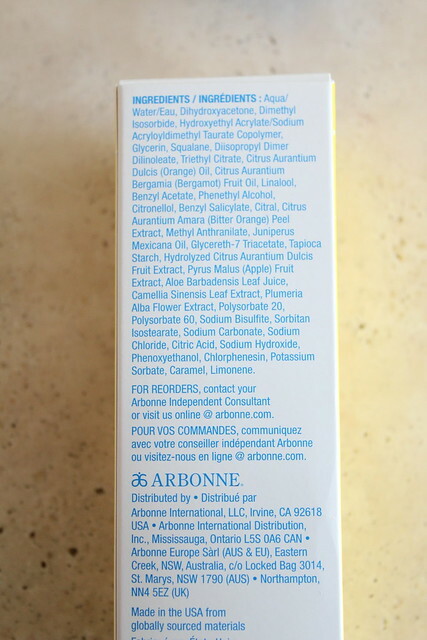 I use it as a day cream under sunscreen and makeup, and at the end of the day there is some dryness showing in my skin. I also felt that it took a bit of time to absorb, but once absorbed it didn’t feel greasy or heavy at all. 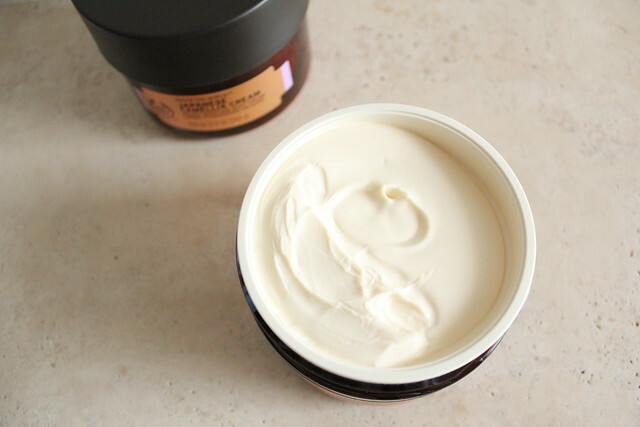 Priced at $30 for 50mL, you can purchase the Shiso Moisture Cream from The Body Shop. Ingredients: Water (Solvent/Diluent), Ethylhexyl Methoxycinnamate (Sunscreen), Ethylhexyl Salicylate (Fragrance Ingredient), Octocrylene (Sunscreen), Isododecane (Solvent), Hydrogenated Polydecene (Skin Conditioning Agent), Glycerin (Humectant), Arachidyl Alcohol (Emulsion Stabiliser), Butyl Methoxydibenzoylmethane (Sunscreen), Butylene Glycol (Humectant), Glyceryl Stearate (Emulsifier), Polymethylsilsesquioxane (Opacifying Agent), Behenyl Alcohol (Emollient), PEG-100 Stearate (Surfactant), Caprylyl Glycol (Skin Conditioning Agent), Arachidyl Glucoside (Surfactant/Emulsifying Agent), Ethylhexylglycerin (Skin-Conditioning Agent), Acrylamide/Ammonium Acrylate Copolymer (Binder), Magnesium Ascorbyl Phosphate (Antioxidant), Perilla Ocymoides Seed Oil (Skin-Conditioning Agent), Xanthan Gum (Viscosity Modifier), Fragrance (Fragrance), Dimethicone (Skin Conditioning Agent), Polyisobutene (Binder), Glyceryl Caprylate (Skin Conditioning Agent), Phenylpropanol (Solvent), Phytic Acid (Chelating Agent), Dipotassium Glycyrrhizate (Skin Conditioning Agent), Glycyrrhiza Glabra (Licorice) Root Extract (Conditioning Agent, Humectant), Polysorbate 20 (Emulsifier), Sorbitan Isostearate (Emulsifier), Butylphenyl Methylpropional (Fragrance Ingredient), Aloe Barbadensis Leaf Juice (Skin Conditioning Agent), Citronellol (Fragrance Ingredient), Hydroxyisohexyl 3-Cyclohexene Carboxaldehyde (Fragrance Ingredient), Hexyl Cinnamal (Fragrance Ingredient).